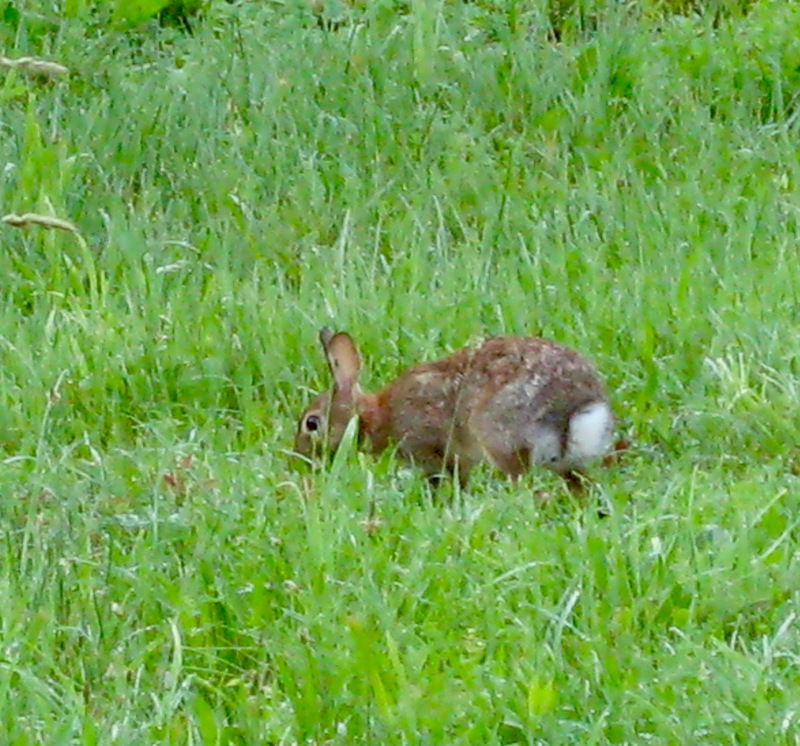 This year, a bunny has set up refuge in our backyard sanctuary, affectionately called Camp Ketchel. As we descend the hill and go into our screened abode Bunny sits totally still in the grass save for its mouth, which always seems to be munching, food or not. Bunny lets us pass within a couple of feet, clearly relaxed with our energy; we are not the danger. The danger is all around, however, be it the fox family that lives very near, or an owl, or perhaps even the occasional eagle that makes its rounds. Death is but an instant away. This is nature. This is nature’s deepest truth: we are all stalked by the greatest predator of all: death. No one escapes. In the meantime, Bunny eats, ears perked, always alert as it forages food for survival. Bunny has a friend, perhaps its mother who no longer accepts the role; all must take responsibility for their own lives. Bunny engages friend in play. They pause in their eating and spring several feet into the air, jumping over one another in pure abandon, their customary alertness to danger momentarily relaxed. Play is part of nature, as important as eating and protecting. 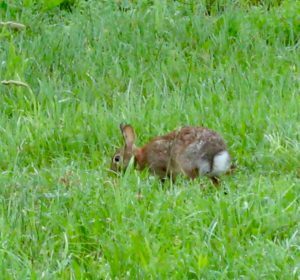 The bunny’s playful moment might indeed be the predator’s opportunity but that doesn’t matter, nature’s imperative to play must be enacted, regardless of cost. Humans are animals as well. Though we hide behind a mote of reason and civilization, the truth is that the predator is always stalking. Despite all our medical genius no one and nothing can change our ultimate appointment with death. At a primal level, the animal within us is well aware of this truth. On a primal level we are no different than the bunny, always watching, waiting, listening for the predator’s knock. Hence, anxiety is, at least on some level, a normal primal feeling in everyday human life. To think this shouldn’t be would be to deny our human animal reality. We may indeed be spirit beings who will live in infinity, but our animal selves will most assuredly die. But let us learn from Bunny as well. As important as it is to be on our guard, it is equally important for us to completely release our guard and relax into pure play. Nature absolutely demands this of us. We must play with abandon to fulfill our animal nature. We must allow ourselves to breathe deeply into the abdomen and break the constriction of rigid fear. We must completely relax our muscles, going deeper into calm and utter joy in our animal being. And when we are called back to alertness and fear, we must acquiesce and be present to it. This opposition within our primal selves, of fear and play, can only be resolved by allowing ourselves to oscillate between each pole, flowing in accord with the true nature of each moment. Sing a new song today, hum a new tune, get in harmony with your spirit, for it is time for something new. Within the self you already know this and yet the old tunes still rumble through your mind. Attune with your heart, for that is where the song of you resides, just waiting for you to hear its beat, decipher its words, and bring to life its lilting melody. In peace and harmony sing out the song of you, straight from the heart! No audio channeling today, check out today’s Soulbyte instead, posted on the channeling page. Next audio channeling, Monday June 6, 2016. Find happiness in your own balanced state of being, within yourself, as you pursue your inner work, as you change and evolve. As you take your journey of transformation all things previously thought unattainable have the potential to be realized, so smile a little more each day. It will do you good and your face turned to the world with upturned lips will shine a little brighter at each step you take, lighting your way and bringing a smile to the lips of those you meet. Smile! Patience. Flying through life, pushing for things to happen may not be the best course of action. In patient waiting that which is sought is often clearly revealed. Too often the mind and body jump ahead, wanting something immediately, when the spirit knows that patience is the only action needed. Try it out. Wait patiently. Let that which is inside of you stir to life. It’s probably just what you want. The only question is, can you handle it? Once again: yes, you can, with patience!